I bought Padini less than two months ago. It was a good company and is still a good company. (Most of the companies I have bought I would consider them as good quality companies - if you happen to check their share price now against the price I sold, hence I am a poor seller.) However, for Padini, during the time I bought I was catching it at a downtrend, and happens to be I bought at almost its low for that short period. Now, after 2 sen dividend and capital gain of 4.5%, I decided to sell. Seldom do I do this, but I just would like to take profit on Padini. Now, this is what I did on the same day - today. In my previous article less than a month ago, I have mentioned of the scenario surrounding the share price and its warrants. I guess many did not really catch my reasoning as I did not reveal many things. Surprisingly to me this is one of the least read article despite me doing a lot of work on this. From the offer till todate (11 Jan 2013), there have been about 11.75 million warrants (those not owned by PNB) exercised to the mother share. This shows that only about 16.25 million shares are yet to be exercised. PNB itself has exercised some 79 million of the warrants thus far (see below). There is reason to believe that it will exercise the entire portion of warrants it owns by the conversion date - 21 January 2013 - as it bought many of the shares at the price of RM0.96 from shareholders. Yes, it controls the majority of the shares and whatever dilutions mainly affect itself, but still illogical not to exercise. Furthermore, I have no doubt PNB has the funds to do so. 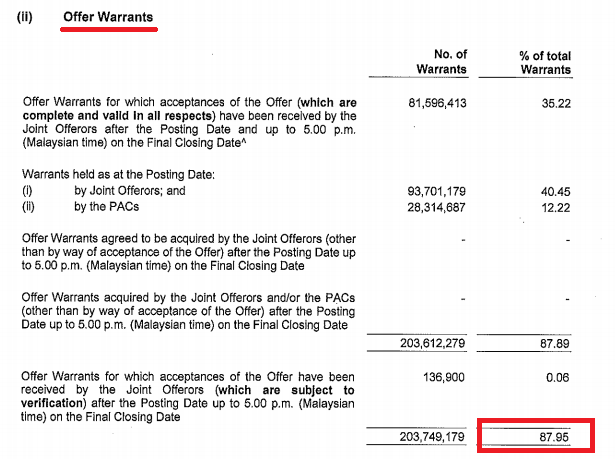 Full exercise of the warrants would have diluted the NAV of SP Setia but since it is now trading at around RM3.12 and the exercise costs of the warrants is RM2.99, I would think the dilution is not worrying. Anyway, as I have mentioned before in the previous article, the private placements and ESOS would have a bigger impact in terms of dilution. There are even bigger question marks in both the Private placement and ESOS themselves as the shares are being bought at RM3.95 while warrants bought at RM0.96. Assuming the private placements and ESOS (both 15%, hence totalling 30%) are issued at discounts of say 10%, some people would have gotten the shares at very cheap. The discounts would have diluted the value of SP Setia's shares but I could not understand the reason for the sudden drop in share price to now RM3.12. 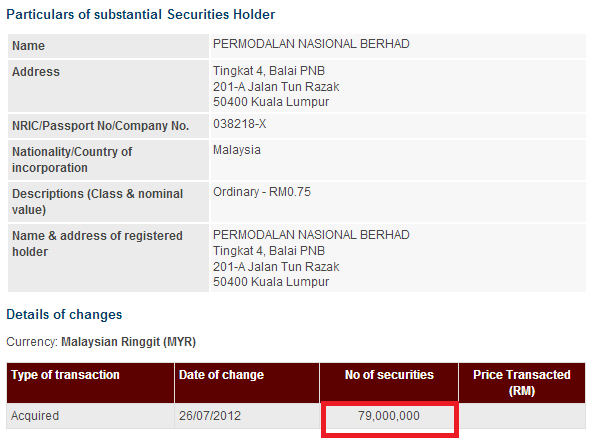 If I am PNB, I definitely would not want to issue more shares at below my purchase price during the General Offer. However, we know that sometimes share price can be influenced to attract certain shareholders during exercise such as this - you know why most of the time I do not quite like private placements, rights etc now? As a result, I think SP Setia's underlying value (I think the major shareholders would definitely know more) would have been much higher than RM3.12 which is why I am just buying 2,300 units. Not a lot. Whatever your trade on these counters mentioned above are solely your own decision as I am just providing my opinion and I may be wrong. Please do your own research as some of my calculations may not be correct! Just to update with you, there is news from investment bank that YTL Power is in the midst to sell off its local power plant to 1MDB. Based on 1212MW, fixed assets: 990m and profit 250m, the selling price could be worth RM 5-6b. The amount is derive from mixed formula: RM 4.6m/MW; 20x PE and 5.8x fixed power asset est RM990m. The above parameter is based on last year 1MDB acquire Genting Sanyen. Conservatively,lets assume the power plant sell at RM5b, YTL Power should be able to recognized around RM4b net gain, translate to increment of 55sen/share. YTL Power could then opt for special dividend or capital repayment via par value reduction from 50sen to 10sen. To build new power plant, it cost a lot more and take at least 4year to complete. It make sense to utilize existing power plant to continue generate power as YTLP have excellent record in maintenance and upgrading it power generator. According to its annual report, YTLP have replace its paka power station with newly installed latest model, the most efficient HR3 Burners in all its Gas turbines. Overall plant availability keep at optimal level with 95.15% at Paka Power Station and 99.05% at Pasir Gudang Power Station. The combined power production by both station was 102.81% of the scheduled qualities. Therefore, despite the concessionaire is going to expire in 2 year time, its power plant still able to keep continue generating power supply. Therefore, it make sense for IMDB to acquire these power assets even have to pay full value for it as the readily available power plant will shorten time to rebuild and get rid execution risk. Reading this, I think selling to 1MDB is a high possibility with the recent spate of purchases. 1BestariNet is a project initiated by the Malaysian Ministry of Education (MoE) and carried out in partnership with YTL Communications. Under the project, 10,000 primary and secondary public schools in Malaysia will be equipped with high-speed 4G Internet access and a virtual learning platform, providing fast and reliable Internet connectivity as well as access to a world-class Integrated Learning Solution known as The Frog VLE. Recall Franchis Yeoh claim that Yes need at least 100,000 subscriber to breakeven. It only need 0.1% of total 10m 1Bestarinet Yes 1D opt for data plan (2.5sen/MB) to surf internet, Yes wimax already can profiting. Sorry, i quoted wrongly, Yes need at least 1000,000 (1m) subscriber to breakeven. So, it need to attract 10% of total 10m 1Bestarinet Yes 1D opt for data plan (2.5sen/MB) to surf internet to turnaround wimax. sorry for cannot understand your writing, I don't quite understand this statement"
As a result, I think SP Setia's underlying value (I think the major shareholders would definitely know more) would have been much higher than RM3.12 which is why I am just buying 2,300 units. Not a lot.". Since the underlying is much higher than 3.12, why you just bought 2300 units, you should have bought more than that with your cash reserve.